More paperwork! Angela Aingel could not believe she had more financial and parenting “homework” to do. Her attorney had explained to her that she would need to serve DISCOVERY on her soon-to-be-ex-husband Art. “We already did all that financial stuff!” Angela complained to her attorney. “What’s the difference?” Angela asked, wanting to hear the explanation as to why she was forced to jump through all these hoops, as if the emotional stress of divorce wasn’t already enough. “I don’t even know where to start!” Angela exclaimed. “Why would anyone object to discovery about the divorce?” Angela asked. Shortly after this conversation, Angela received an email entitled “discovery and depositions” from her friend Desdemona DeVille, who was also going through a divorce. Angela had reached out for some help preparing these documents and Desdemona, who was further along in the process, was happy to oblige. After looking through her friend’s suggested questions, Angela felt more confused than ever. Desdemona seemed to think discovery was a free for all, given all the topics she raied. Angela decided to give her friend a call. “What does that even mean?” Angela asked. Angela sighed, sounding surprisingly like her attorney. Angela wondered if Desdemona’s questions were the type her attorney had been thinking of when she said Angela would be surprised at what some people ask. “The interrogatories and document requests should be about things that are relevant to the case,” Angela tried. “OK, well you need to do what is best for you. As for me, I am going to listen to my attorney. What is the point of paying her if I throw her suggestions out the window?” Angela said. “Oh, Des,” Angela answered softly, but Desdemona was off on a rant and not listening. Angela had hired her attorney for sound legal advice and to get the process done as expeditiously and fairly as possible. Sure, she wanted maintenance and child support to help her get started on a career, to provide for the kids, but it was not her goal to destroy Art. He was the father of her children. He would be in their lives forever, and to a degree, in her life as well. Vendetta had never been her style. That sounded more like … well, it sounded more like Desdemona actually. As she had thought before in earlier stages of the divorce process, Angela thought she should listen to what Desdemona said to do and do the opposite. Desdemona’s advice about refusing to agree to a Stipulated Case Management Plan in order to wreck the men’s bike trip had turned out to be bad advice costing Art and her unnecessary attorney fees. They could have accomplished the same things by agreement instead of going to court. Angela addressed the task of preparing questions and document requests for her non-pattern discovery requests. She asked about details surrounding Art’s pension and retirement account. She asked about passwords for some accounts and about a “mystery checking account” where she only knew of the last four digits. She sure hoped that Art was not hiding money in that account. Angela’s attorney crafted her handwritten questions into NON-PATTERN INTERROGATORIES and DOCUMENT REQUESTS, which she served on Art. Within a day, Art served Angela with his own set of the same Discovery Requests. Her attorney said she had 35 DAYS TO RESPOND. 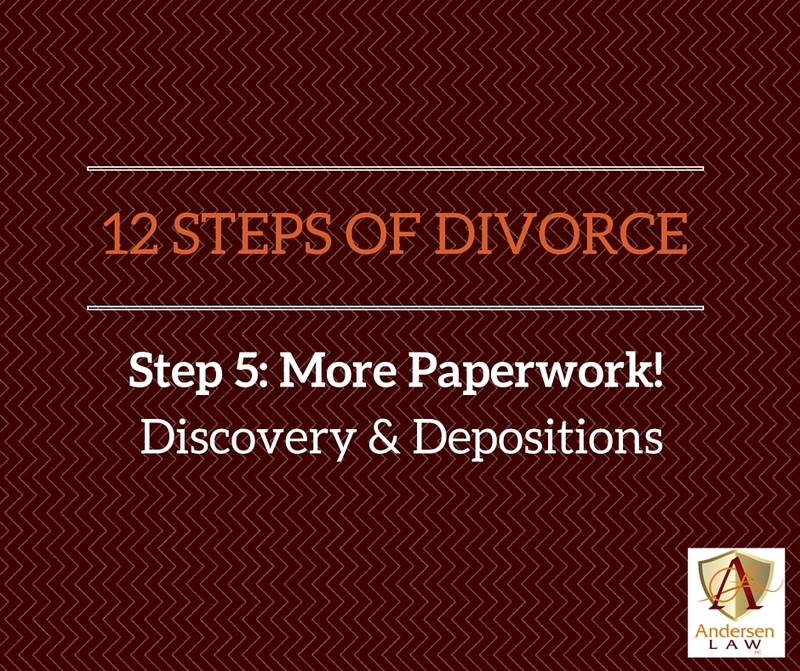 She worked hard to meet the deadline with a timely response, getting her documents to her attorney a week ahead of the deadline so they had time to formalize their answers and bate stamp and organize the documents to be provided. Art Aingel similarly responded to Angela’s Discovery Requests within the 35-day deadline to respond. He served her with a formal RESPONDENT’S RESPONSE TO PATTERN AND NON-PATTERN INTERROGATORIES and RESPONDENT’S RESPONSE TO PATTERN AND NON-PATTERN DOCUMENT REQUESTS. Angela found his answers informative. It was reassuring to find out the “mystery checking account” was a closed account that did not have funds in it. It was also reassuring to find out that Art had continued to pay the mortgage and household bills on a timely basis. Desdemona said that Draco had immediately stopped paying the mortgage and all the household bills when she filed. This had resulted in an emergency temporary orders hearing. Desdemona bragged that she won her attorney fees in that attorney. This could not prevent Angela from thinking that just meant she got back some of the money she had paid in the first place, not to mention the stress and time commitment. Desdemona said that they also had MOTIONS TO COMPEL, TELEPHONE CONFERENCES WITH THE COURT and more hearings when each of them failed to respond to discovery requests on a timely basis. All of this just sounded like a waste of time and money to Angela. Angela also asked her attorney about the possibility of a DEPOSITION. The word sounded ominous: she had heard it was pretty much the same thing as a trial. The attorney explained that a deposition was an opportunity to ask another party, or a third party, questions under oath. Depositions were recorded, usually on video, and were then transcribed and made into a written transcript. The good news, the attorney reported, was that depositions were rarely needed in a relatively straightforward divorce like the Aingels’. Angela was relieved about not needing to do a deposition. The attorney stated that it was up to Art whether he wanted to depose her. Angela hoped he would not. The longer the divorce went on, the more she wanted the process to be done. Maybe Desdemona enjoyed prolonging the drama with depositions and one hearing after the next, but for Angela, a settlement was sounding more and more like a good idea. “Got it,” Art said, thinking to himself, listen to what Draco says and do the opposite. Questions for June (Professionals: CFI, PRE, Vocational Evaluator, Appraisals): What is a CFI? What is a PRE? Why are so many professionals allegedly needed in divorce? Are they really necessary? 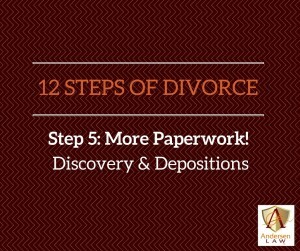 If you need help getting through all the steps of your own divorce, contact Andersen Law PC today. Email beth@andersenlawpc.com or call 720-922-3880.